Bombardier’s CSeries returned to the Farnborough Air Show in July. The same spot where the program was launched 10 years ago. Even so, the UK show has not been kind to the airplane over the years. But neither has Paris. 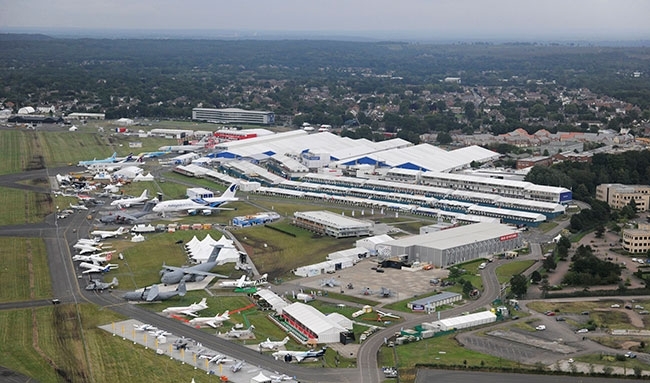 Will the 2018 edition of Farnborough be any different? Bombardier estimates demand for 6 Bombardier’s CSeries returned to the Farnborough Air Show in July. Forecasting can be a bit of a mug’s game, and the UK turnstiles will be clicking as Wings goes to press. Still, there are encouraging signs that Farnborough will deliver the CSeries its strongest air show performance to-date. For starters, Farnborough is as much a program reset as it is a return. On July 1, while most of us flipped burgers, set off fireworks and counted down the return of hockey, Bombardier and Airbus finalized a deal to transfer majority ownership of the CSeries to the European consortium, although the program remains headquartered in Montreal (see On the Fly). Paris and Farnborough are where airplane builders love to generate industry buzz by fattening their order books. It is difficult to picture Airbus not wanting to make a splash, beginning with a rebranding of the program. Bloomberg News reported in April that the CSeries was set for a name change, to leverage the Airbus brand and send a signal to potential buyers that the program is here to stay. Boeing had previously rebranded the McDonnell Douglas MD-95 as the 717 after inheriting the program during a merger with its former U.S. rival. The 717, which once gave Boeing a clean shot at the lower end of the 100- to 150-seat market, was cancelled in 2006 after only 156 were built. A similar fate is unlikely to greet the CSeries which is clean-sheet technology, whereas the A320neo and 737 MAX are second and fourth iterations of mid-1980s and 1960s platforms, respectively. The likeliest designations for the rebrand are A210 and A220, making the former CS100 and CS300 models the first aircraft in a new Airbus 200 family, leaving the door open for stretched versions of the platform, which is what Airbus and Boeing had feared since the program was first launched. The grapevine was ripe ahead of Farnborough that David Neeleman, founder of JetBlue Airways, Brazil’s Azul, and who helped launch WestJet, has already ordered 60 CS300s for a new American startup, Moxy Airways. Neeleman is reported to be raising US$100 million from investors including former Air Canada chief executive, Robert Milton, according to the UK’s Economist. Moxy will launch in 2020, coinciding with when the first American-built CSeries will begin rolling off a second assembly line at Airbus’ A320 production facility in Mobile, Alabama. The Moxy story was broke by Airline Weekly, an online industry newsletter, which is reported to have seen Neeleman’s investor presentation. Moxy will follow the Azul model, providing point-to-point service between secondary airports, while using the CSeries advanced economics and comfort level to sidestep the austerity of ultra-low-cost rivals. Bombardier estimates that many secondary and tertiary markets have lost jet service in recent years as larger narrow-body aircraft have made these routes uneconomical for mainline carriers. Moxy would become the second largest customer for the CSeries after Delta Airlines, which is expected to take delivery of its first aircraft next year. Both customers could provide a showcase to stimulate orders in the struggling 100- to 150-seat sector. Bombardier has gone to air shows before where speculation was ripe for a marquee CSeries order, only to leave empty handed. Most notably Paris in 2011, where an order from Persian Gulf carrier Qatar Airways appeared imminent. With or without Moxy, it feels different this time. In December, EgyptAir finalized an order for 12 CS300s, with purchase rights for an additional 12, and Latvia’s airBaltic, the launch customer for the CS300, fast tracked an order for a further 30 aircraft to secure delivery positions ahead of the Bombardier-Airbus tie up, where it is expected that more potential customers are ready to ink deals. “We could have waited, but we were of the opinion that we better buy them now to secure these [delivery] positions, not to risk that after the takeover somebody else takes them,” Martin Gauss, airBaltic’s chief executive told Reuters. As of Farnborough, the CSeries is dead. Long live the A200.